On cruelty to our beloved animals. One just cannot ignore such cruelty as this! I am really sorry folks but both today and tomorrow I am adding my tiny shoulder to a very large and heavy wheel. Endeavouring to make a very small difference before I leave this land of the living. But before going on to share something that was sent to me by Scott Beckstead, the Senior Oregon and Rural Outreach Director of The Humane Society, I want to repeat something that I wrote in response to a comment left to yesterday’s Picture Parade. Because it may be seen as utterly irrelevant to today’s complex world but, nonetheless, it does explain where my love of this planet comes from. Those beautiful dog’s spirit lives on in the air you breathe, the green of the trees, the beating wings of a hummingbird, the house where they lived and where ever they ran and played. I hope you and Jean feel their presence when things are rough and in the quiet of the night. There is something wondrous about the nature of the human consciousness that still escapes science. Neither me nor Jean are believers in a ‘God’ or subscribe to religious ‘factions’ for so much pain, war and suffering may be laid at the feet of religions (excuse my rant! ), but …. But there is something magical in “the air you breathe, the green of the trees, the beating wings of a hummingbird,” that defies definition. I like to think of it as a deep, connection with the planet that is our womb and sustains us. This really smacked into me in back in the early 90’s; something that forever changed me. That something I experienced roughly about 4 days out in a solo sailing passage from the Azores to Plymouth. I came up on deck, clipped on, and looked around me. Primarily on the lookout for steaming lights that might indicate a ship in the same patch of ocean. It was after midnight. Having checked there wasn’t a ship in sight, I looked up at what was a totally cloud-free night sky. It put into perspective, emotionally, visibly, intellectually and spiritually, how irrelevant one human being is and yet, how each of us is, or should be, the custodian of something immeasurably precious and beautiful: Planet Earth. 4. Killed a protected Oregon wolf. All of these incidents were caused by the M-44, a device used by Wildlife Services that fires a cyanide pellet into an animal’s mouth, causing a slow and agonizing death. PLEASE CONTACT YOUR SENATORS AND U.S. REP AND URGE THEM TO ELIMINATE FUNDING FOR USDA WILDLIFE SERVICES. Scott then included a link to an article that was recently published in The Oregonian. I am taking the liberty of republishing it in full. Labrador killed by cyanide device in Idaho, boy knocked to the ground. A three-year-old Labrador retriever died and a 14-year boy was knocked to the ground when a cyanide device deployed by the federal government exploded in Pocatello, Idaho. The Idaho State Journal reported the boy, who had been on a walk with his dog Thursday on a ridge near their home, watched his dog die. 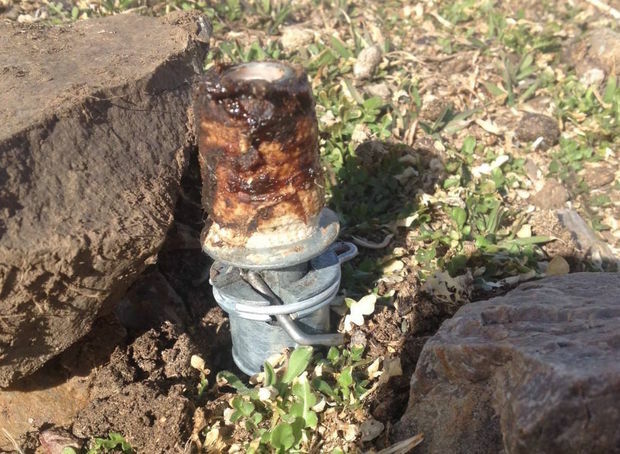 According to the Bannock County Sheriff’s Office, the boy was also “covered in an unknown substance” when the device known as an M-44 detonated. He was evaluated at a hospital and released. The Idaho incident comes a few weeks after a gray wolf was accidentally killed by an M-44 on private land in Oregon’s Wallowa County. The controversial type of trap is used by the U.S. Department of Agriculture’s Wildlife Services crews around the country primarily to kill coyotes and other predators. U.S. Rep. Peter DeFazio, D-Ore., introduced legislation as recently as 2012 to ban the trap. DeFazio has said he would reintroduce a similar bill in Congress. The wolf death was the first documented “incidental take” of its kind in Oregon involving the protected animal and the M-44, fish and wildlife officials said. Federal Wildlife Services officials said there were 96 M-44 devices dispersed across Oregon as of last week and the agency was looking to remove devices that were near known wolf habitat. Oregon fish and wildlife officials have said the devices were not allowed in areas of known wolf activity. Oregon has long paid Wildlife Services to kill invasive species and specific predators. But Gov. Kate Brown’s’ recommended budget doesn’t include $460,000 typically set aside to pay the federal agency to kill animals in Oregon. The department circulated photos of the trap. “If a device such as this is ever located please do not touch or go near the device and contact your local law enforcement agency,” officials said. Government officials have said the number of deaths of domestic animals and non-target animals each year is low, and officials say they are conducting an “internal review” of the wolf death. Wildlife Services killed 121 coyotes in Oregon in 2016 with M-44 devices, along with three red foxes, according to the government’s figures. No gray wolf was killed in the U.S. last year with the cyanide capsules, according to the government. A Eugene nonprofit says the government isn’t being truthful about the number of pets and non-target animals – such as wolves – killed each year. “Yesterday’s Idaho poisoning of a dog and the near poisoning of a child is yet another example of what we’ve been saying for decades: M-44s are really nothing more than land mines waiting to go off, no matter if it’s a child, a dog, or a wolf,” Brooks Fahy, executive director of Predator Defense, said in a statement. I will be writing about another terrible example of cruelty to animals tomorrow. One where you have the opportunity to add your name to a petition trying to have this cruel ‘tradition’ stopped. As opposed to dogs being our guardians, it us truly the other way around. We are called to be their guardians and protect them and they are our great totem animal teachers and guides. Exactly! Humanity needs to embrace the teachings of dogs so very badly. Or perhaps better said that those in positions of power, who should be the guardians of our futures, should be protecting our planet. Amen! Going to email you a funny video about a cat and a bunch of dogs! Got it! Is it on YouTube? Maybe, a close friend emailed it to me, and I just adore it! Enjoy! Wow, this is so wrong and out of line. I pray this boy who saw his dog die, will be ok. Both physically as well as mentally. Why the device is even used is so messed 🆙. Yes, this report raises so many questions. I hope Scott will keep us in the loop on this terrible method. It needs to be banned! That is terrible, Paul. I didn’t know anything about those methods. Isn’t that a government organization that should be looking out for wildlife? Thank you for bringing this to our attention! Maybe if awareness of the issue happens through journalistic efforts & blogging efforts (such as your own) then it will stop. Government has no sense of right or wrong or what any form of cruelty entails. I will do what I can to try to stop this form of cruelty by contacting appropriate officials. But I don’t have any hope. Folks just had better keep their pets on leash and kids supervised outdoors. This is probably the tip of an ice berg. While I am strongly inclined to agree with your assessment, let us never stop trying to make things better! I thought Wild Life services were supposed to protect life, NOT Kill young children’s pets and nearly kill the young boy in the process.. What if that young boy had died?? Are they being taken to task for their actions?? And How can they be in charge of such a lethal substance? I am shaking my head yet again at what comes from the USA.. Sorry Paul.. I know its not all.. but its just such a cruel and horrible way to kill ANY animal..
Sue, without a doubt this is Government sponsored cruelty! Totally! Big hugs to you! Tweeted and Facebook’ed this post. This story is shocking and horrific and USDA Wildlife must be stopped! Let’s hope there is a change of policy, and soon!